As we all know too well Spring is late this year and what flowers there have been are sparse. Our local hedgebanks and verges have been dominated with Celandines and Violets, but little else. Driving home yesterday I caught a glimpse of another colour as I turned down a local lane. I pulled over to investigate and was welcomed by the mauve flowers of Cuckooflowers. 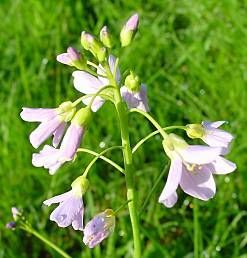 The Cuckooflower (Cardamine pratensis), also known as Lady’s-smock, is a common plant of meadows and moist woods. 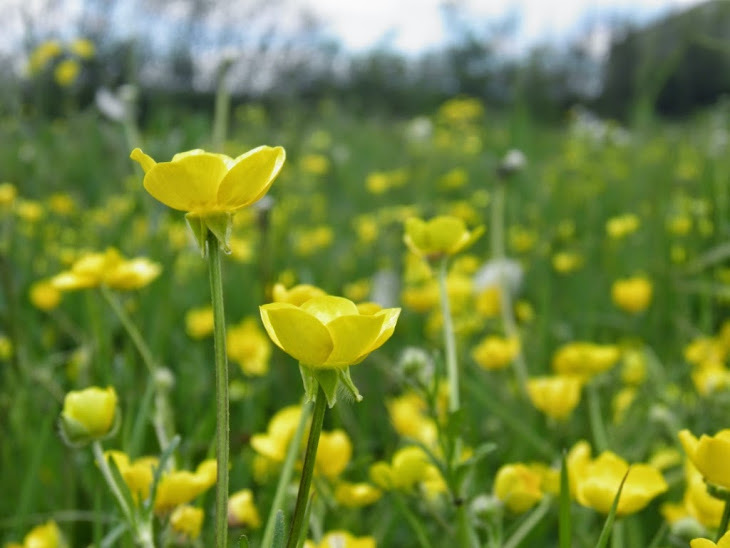 A literal translation from its Latin name is meadow (pratensis) cress (from the Greek, kardamis). Other wildlife shares the specific epithet, ‘pratensis’ in a similar way such as; Meadow Sage (Salvia pratensis) and Meadow Pipit (Anthus pratensis). The Cardamines are a large genus of pungent herbs, many known as bitter cresses, and part of the larger Crucifer or Cabbage family. The crucifers are so named due to having 4 free petals arranged in a cross. It is hard to see the cabbage in a cuckooflower unless you have let your brassicas go to flower and then the yellow cruciferic petals become all too familiar. The closely related bitter cresses, such as Wavy Bitter-cress (Cardamine flexuosa) are common in our garden at the moment, and are a great addition to a salad, sandwich or simply to graze on. The Cuckooflower is also very edible and once used as a salad vegetable (*). However, I would rather leave them to enliven the verge and feed other wildlife such as the Orange Tip butterfly.